Wizard of Oz Comes to Medicine Hat, December 19th, 2010 at the Medicine Hat Arena! This magical production, based on the Royal Shakespeare Company’s celebration of the 1939 MGM movie, is presented with breathtaking special effects that will sweep audiences away, from the moment the tornado twists its way into Kansas. Students at St. Mary’s School are getting everything in order for next week’s performances of they’re most challenging musical yet – Fiddler on the Roof Jr. This special edition of one of Broadway’s greatest masterpieces, Fiddler on the Roof Junior, covers the full range of human emotions as seen through the eyes of one of the greatest stage characters, Tevye the Dairyman. With this production, St. Mary’s School continues to bring outstanding musical theatre for the whole family to Medicine Hat. Probably the most challenging task of this one is reaching out to the kids, having performed in 3 of the musicals myself, they will not compare in any way to this. St. Mary’s is back with their annual presentation at the Esplanade starting April 27-28 at 7:00 PM. Cost to see this play is $10.00 + S/C and GST. Call 403-502-8777 for tickets or visit Tixx Central. Hedwig and the Angry Inch is a rock musical about a fictional rock and roll band (The Angry Inch) front by an East German transgender singer. The musical premiered off-broadway in 1998 and the film adaptation was released in 2000, starring and produced by writer John Cameron Mitchell. The local production features 11 full songs, with the band on stage throughout the entire show, a band featuring a handful of local punk rock veterans (One Shot Left, Rex Stiff, Iverdale). 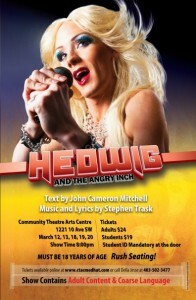 You can guarantee this will be the heaviest rock musical to ever run in Medicine Hat! Tickets available online at http://www.ctacmedhat.com or by phoning Della Jesse at 403-502-3477.